You know how some people can’t watch a movie for even ten minutes without asking anyone who happens to be around: “Who’s that guy and why did he do that?” I’m not one of those people. I will patiently sit through the inevitable confusion of the beginning of most stories which begin in medias res, knowing that things will clear up eventually. The first two issues of Daredevil Noir featured quite a bit of going back and forth in time, which was a little challenging at times but not more so than many other stories worth investing your time and interest in. This issue, there’s only one time line to keep track of, but with the twists and turns and layers of deceit where everyone seemingly has a catch on everyone else, I’m left feeling… stupid. I’m not used to feeling quite this bewildered reading a story which leads me to suspect I’m not the only one feeling this way. It’s quite possible that this story is getting a little too complicated for its own good. If I were to carefully reread each issue and take out a pen and paper and make notes, I’m sure I could make everything match up, but the problem is that I shouldn’t have to. There is also a particular reveal at the end of the issue that, while hinted at previously, feels a little far-fetched and failed to make perfect sense to me. That is a shame since the mood and style of this series feels so real you can almost taste the rain that threatens to drown Hell’s Kitchen throughout the series. The highpoints of this series continues to be the art and the poignant, almost poetic, writing. There are scenes in this issue that show movement in really interesting and stunning ways , such as having a train interrupt a scene that gives us a clear before and after, and Irvine writes in a way that sets the mood perfectly and gives us a wonderful window into Matt’s perceptions. And I’m open to the idea that next issue will be a great one and really make everything fall into place, but for now I remained just a little bit too confused for comfort. I hope it will pass. 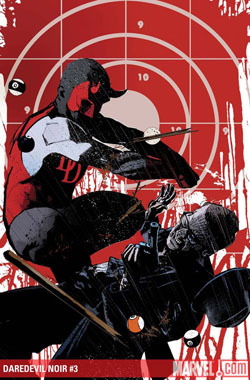 Why is Daredevil smacking poor Ben Urich in that cover o_O ?